Day 01: Receive a warm arrival at Dhaka. Transfer to hotel. After refreshing yourself start your expedition with National Museum, Dhaka University campus (Curzon Hall) and National Assembly. Have a relishing Dinner at a Chinese restaurant. Night Halt at Dhaka. 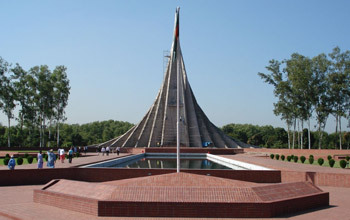 Day 02: Start your expedition post-breakfast with Savar (20km) to visit the National Memorial. Explore the Dhamrai metal antique village and Heritage Park followed with lunch. Have a small visit in handicrafts & souvenir shop before Dinner. A splendid Dinner at a traditional restaurant. Night halt at Dhaka. Day 03: Morning departure from Dhaka Post-Breakfast. Transfer to Airport.